Mi Kayin villagers in Hpa-an Township held a prayer service for the protection of their land and natural resources threatened by the proposed cement plant on March 29, 2016. 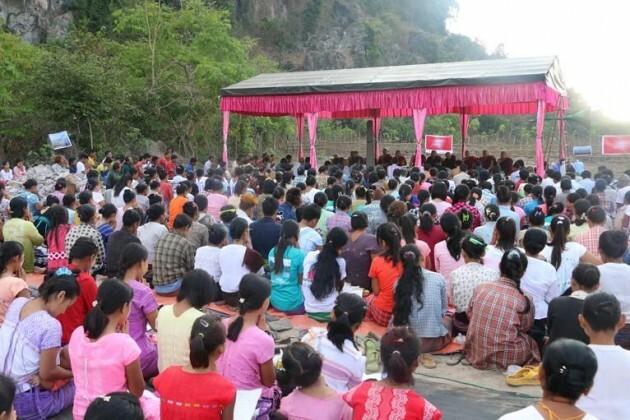 The villagers gathered at the base of Mi Kayin Mountain for the public prayer service after a recently revived proposal to develop a limestone quarry and cement factory near their village. Mi Kayin community, a coalition of local villagers and Karen environmental civil society groups put out a statement on March 29, 2016 to voice their concerns over the cement plant proposal. The proposal has now been revived again last week by Colonel Saw Chit Thu, a central advisory and management member of the Karen Border Guard Force (BGF), a government-backed militia whom the Mi Kayin community claim has a well-known record for corrupt business deals. On March 19, a pre-consultation meeting organized by Colonel Saw Chit Thu was held in Hpa-an and attended by over 70 people including local villagers, representatives from community based organizations, Karen State government official, Karen Literature and Culture Committee, religious leaders and Karen armed groups such as Karen National Union, Democratic Karen Benevolent Army (DKBA), and Karen Peace Council (KNU/KNLA-PC). Speaking at the meeting Colonel Saw Chit Thu talked about his plans for the cement factory. According to information shared at the pre-consultation meeting, the proposed cement plant will be invested in by a Chinese company and managed by Colonel Saw Chit Thu’s Chit Lin Myaing Company. The estimated amount of money to be invested in this proposed plant is US $3 billion. The power for the plant will be generated from a coal power plant that is included in the proposal. During the pre-consultation meeting, Mi Kayin villagers, monks and government officials urged that more time was needed for discussion with the local community. This was supported by the KNU representatives who urge for more time to be taken before proceeding. Karen community-based-organizations working on social and environmental issues have repeatedly called for all large-scale developments in Karen State to be halted while there is not any meaningful political settlement in the country. According to sources from Karen Environmental and Social Action Network (KESAN), Mi Kayin village is one of 11 proposed cement production sites in Hpa-an township, that many fear will cause serious damage to local livelihoods. In the Mi Kayin community statement, Saw Tha Phoe from KESAN said that economic development for ethnic people should be based on the participation and desires of the local community, and must respect traditional culture and livelihoods. However, most development projects in Karen State have actually created more poverty and trouble for the local people.